My son, 5, stood by my side, a rainbow-colored floatie strapped to his back. It was late February, and we were at the edge of an artificial tide pool at the far end of the Barbados Boardwalk, a stroller-friendly beachside promenade on the southwest coast of the island. Lazar regards the ocean with deep suspicion; his brother, Django, 2, even more so. So my wife, Ingrid, and I brought them to the tide pool in hopes of luring them in. We soon had help from a trio of Bajan kids who coaxed the boys into the water and enlisted them in a search for shells. With its sandy beaches, reef-filled waters, and rum-soaked night life, Barbados has long been a favorite destination for cruise ships, surfers, and sun-starved retirees. But this former British colony at the far eastern end of the Caribbean is also a terrific place to bring young children. We were on our fourth visit, part of an annual tradition that includes most of my immediate family. When it comes to sand and surf, Barbados offers something for everyone. The tide pool, for example, is perfect for nonswimmers. On a day with a high surf advisory, it was still as glass; at low tide, even Django could walk out to the boulders that provide a breakwater 10 yards or so from shore. Black crabs skitter across the rocks, and schools of colorful fish — sergeant majors, blue tangs — dart just below the surface. There are public restrooms a few minutes’ walk to the south, and the ArtSplash Center across the coastal highway offers fresh fruit smoothies and natural juices along with art and music classes for kids. Follow that highway a few minutes north by car, and you come to Carlisle Bay, a natural harbor with waters so placid that Lazar calls it “a pool with sand.’’ Babies and toddlers can bob gently in place as their parents admire the postcard views of the capital, Bridgetown. Stronger swimmers can venture farther out to see the shallow-water wrecks that lie just 100 yards offshore or the giant sea turtles that feed even closer in. There are umbrellas and beach chairs for rent, and lifeguards monitor the area from a bright yellow tower, behind which are public showers, restrooms, and free parking. Beyond the beaches, the Barbados Wildlife Reserve and the adjacent Grenade Hall Forest and Signal Station have become such favorites that the zookeepers remember us from year to year. The reserve has free-ranging peacocks, turtles, and other exotic fauna, and enclosed reptile and bird displays. Grenade Hall hosts a restored 19th-century military signal tower with a museum inside. The stars are the green monkeys, which the zookeepers lure from the trees with handfuls of sunflower seeds. If you are lucky, these playful creatures will even let you pat their surprisingly stiff fur. You can picnic at the tables on the Grenade Hall side of the compound, but if you bring raw fruits or veggies, the monkeys might steal them. Once you get used to driving on the left, the island is easily navigable by car, which makes it a breeze to find shady attractions during the peak sunburn hours of 11 a.m. to 2 p.m. On this trip, a case of swimmer’s ear drove us to do even more dry-land exploring than usual, which revealed another point in the island’s favor. A Bajan friend recommended a clinic just outside Bridgetown where care was both efficient and affordable. Seeking medicinal spirits, we headed to the Foursquare Rum Distillery and Heritage Park, which features an eco-friendly rum-making facility along with other attractions on the ruins of an abandoned sugar factory. We all enjoyed the folk museum, with its collection of carnival masks and handcrafted children’s toys. And the distillery, with its massive copper still and fountain-like water purification system, was a hit with our mechanically inclined boys. Those who lack the engineering gene can blow off steam in Papa’s Playground, which is decorated with massive gears from the old sugar factory — or enjoy a drink at the Distillery House, an 18th-century pile of coral stone whose cool interior contains a selection of rums for sale by the glass and bottle. Other stops included the Flower Forest, a semi-wild botanical garden whose population of giant African snails delighted the boys almost as much as the sculpted roots of the aptly named Flamboyant Tree; the famous Oistins Fish Fry, where we feasted on grilled seafood and Bajan macaroni pie (avoid the Friday and Saturday night crush, and arrive before sunset to see the colorful skiffs bobbing on Oistins Bay); and repeat visits to Chefette, a chain of high-quality fast-food restaurants whose massive indoor playgrounds put McDonald’s to shame. Like many coral islands, Barbados is riddled with caves. In previous years, we visited the Animal Flower Cave, an underground cavern that opens onto the massive Atlantic Ocean breakers that batter the northern tip of the island (think Niagara Falls with spelunking), and Welchman Hall Gully, a collapsed cave full of tropical plants and shady trees. This time, we headed to Harrison’s Cave, a subterranean cavern located beneath a gully of its own. You can ride the 80 feet down to the gully floor in one of three glass elevators, but an adventure tour interpreter who leads spelunkers through the underground passages offered to guide us down a wooden staircase instead, pointing out the various flora (vermillion Flames of the Forest, hollow-branched Trumpet Trees) and fauna (green monkeys, monstrous snails) with characteristic Bajan humor. Soon after we were on an electric tram, descending another 50 feet into the cave itself: a vast network of natural and manmade passageways lined with stalactites and stalagmites, streams and waterfalls. The grown-ups in our group were amazed, the children that and otherwise: My nephew, 9, loved it; my niece, 6, found the part when they turned off all the lights “scary’’; Django fell asleep; and Lazar liked best, “the glass elevator and the train.’’ Good enough. On the way out, have lunch at Celestine’s, a green and purple shack that serves the best coconut bread on the island. Celestine stepped out of the kitchen to say hello, and wiped the macaroni pie from Django’s face as we chatted. The boys then chased the chickens and roosters around her yard before we headed home for nap time. It doesn’t get any more family-friendly than that. Alexander Gelfand can be reached at alexander_gelfand@yahoo.com. 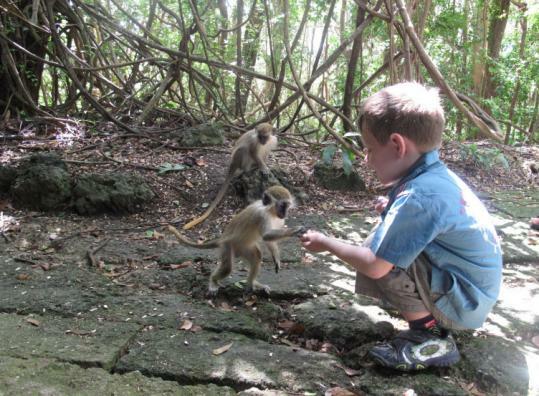 Up-close encounters with green monkeys and other exotic animals. Adults $11.25, children about $6. Fascinating distillery and folk museum, plus playground and bar. Free. Lush above-ground gully, stunning underground cave. Adults $30, children $15. Lovely seaside promenade with tide pool at the northern end. Free. Placid water, sea turtles, and shipwrecks. Free. Beachfront hotel with baby-sitting, kiddie pool, and swim-up bar. Doubles from $214. Children under 12 free. Villas and fully-equipped apartments on the southeast coast, $1,120-$6,300 per week. Great fried chicken, good burgers, roti, and pizza, $4-$18. Bajan-spiced seafood freshly caught, $7.50. Pediatric help available 8 a.m.-midnight, $60; onsite pharmacy.